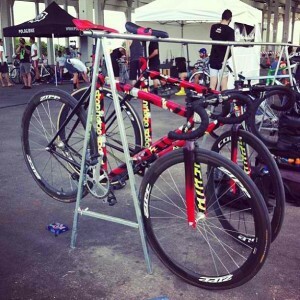 The Red Hook Crit is a world renowned track bike only (fixed gear, no brakes, dude) criterium series that takes place in NYC, Barcelona, and Milan. Knows for its tight, technical courses featuring questionable road surfaces, hairpins, and riders of many backgrounds and levels. Local fixie heroes mingle in the pack with cat one roadies and national level cyclocross and mountain bike racers. Direen (closest to the camera) & Murphy’s High Street Pursuits waiting the final race in Barcelona. Photo from the Stanridge Instagram feed. PG Racer Josh Direen just completed the third in the 2013 series yesterday in Barcelona. Finishing a very impressive 17th place. Direen races for Stanridge Speed Bicycles at Red Hook Crit events alongside his team mate Evan Murphy, and sometimes Dan Chabanov. 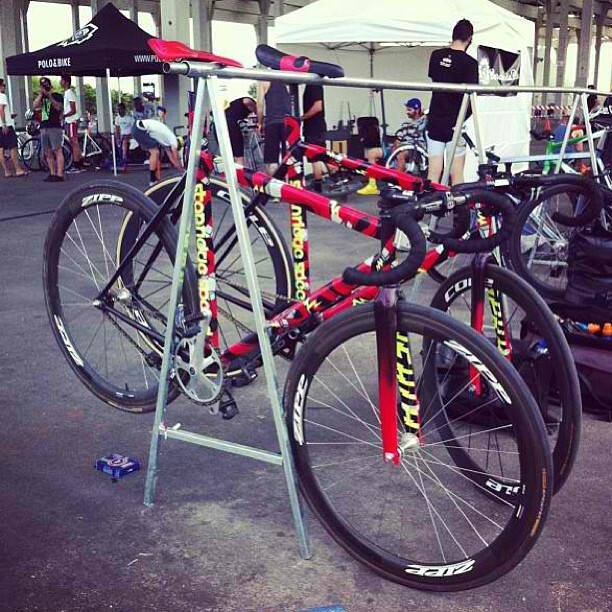 Team Stanridge rides on custom, crit specific, fixed gear frames fine tuned for the race series by Adam Eldridge in Columbus, Ohio. Barcelona marks Josh’s third Red Hook Crit. At his first crit in Brooklyn he was dropped from the lead group and pulled before the finish, placing respectfully, but not completing the full number of laps. In the second edition at Brooklyn Navy Yard Direen, and all of his SRS team mates were forced to abandon the race after a series of crashes caused by an overly technical corner and other rider errors. Direen’s 17th place in Barcelona shows quick improvement, especially from a rider who only raced his first crit of any kind, let alone on a track bike against national level racers, this year. Direen has found success in local USAC criteriums as well, recording wins in the cat five field at the Velo Rose Criterium, Tour de Grandview, and Hyde Park Blast Criterium. Don’t worry, he has already upgraded out of cat five. Round four of the Red Hook Crit series takes place in Milano on October 12th.